Teachers. It was a teacher who first inspired you in a particular subject matter. It was probably a teacher that was one of your first crushes. It was a teacher that gave you the confidence to believe in yourself. They truly are amazing and deserve our appreciation, don’t you think? 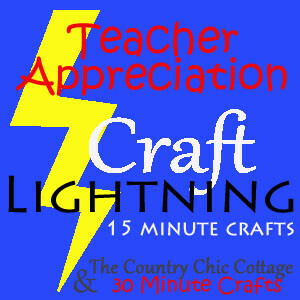 Well, this week, the Craft Lightning series will be focusing on Teacher Appreciation Crafts you can complete in 15 minutes or less. Here’s my super quick and easy craft. This is super easy and so practical. Here’s what you need. Teacher inspired stickers. You can find some in the scrapbooking area of your local craft store. Now that we have our supplies, let’s get started. First, adhere your stickers to your buttons. Then, flip the buttons over and glue your tacks onto the back of your buttons. Once the glue is dried, find a storage container (I used an old Bath & Body Works Candle Jar) for your beautiful push pins. Aren’t these great? Super easy, quick and a gift your teacher will use! Now, are you ready to see other Teacher Appreciation Crafts? Just click on the Craft Lightning button below each day this week!